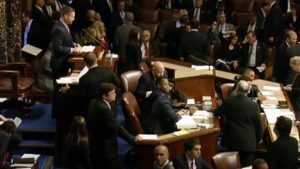 The first to stream United States Congress on the Internet, FedNet is the place online to monitor the action as each day unfolds in the House of Representatives and the Senate. About Us describes the history of the innovative multimedia company, a credentialed news bureau in Washington, DC. We Tweet! Just the coverage, and no more. Can I watch a hearing live on your site? Yes. From time to time FedNet provides live streaming coverage of select committee hearings. Can I watch the House or Senate live on your site? Yes. For over two decades, FedNet has broadcast gavel-to-gavel sessions of the U.S. House of Representatives and the U.S. Senate. Monitor floor action on desktop and mobile devices. How do I know about upcoming coverage? Subscribe to our email Daily Coverage Updates! FedNet updates its dynamic webpage at all hours, striving to keep any scheduling changes to a minimum, subject to any cancellations, postponements and occurrences based on floor schedules or other determining factors. FedNet makes every effort to provide users with the most relevant, most newsworthy coverage each day. Can I repurpose FedNet’s video? No. FedNet provides high quality content subject to the rules of Congress and only with an explicit, written contract. As a credentialed news media organization on Capitol Hill, we can provide live syndication to bona fide news outlets around the world. Our footage has been used on-air by some of the most distinguished newsmagazine shows and cinematic documentarians. Can you cover an event in Washington for my organization? Yes. FedNet consistently exceeds client expectations for high quality video production. See here for more details and call us at (202) 393-7300 to arrange for production of your event with the highest professionalism.